Experience premium performance and extraordinary value in this top quality BBQ grill from Sedona by Lynx. 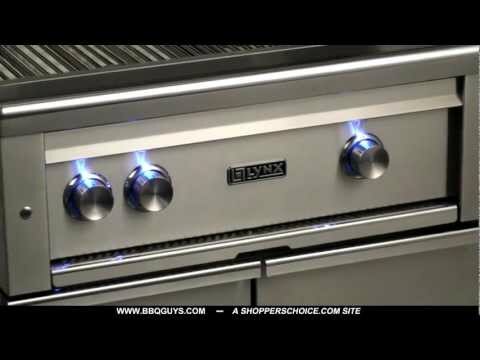 The 36-inch grill has three stainless steel tube burners with a total of 69,000 BTUs. Easily light the grill using the time tested spark ignition system with a battery backup for a reliable start every time. The ceramic briquettes click into place over the burners and distribute heat evenly across the grilling surface. The grill features stainless steel cooking grates with 618 square inches of main cooking area and 273 square inches of warming area, for a total of 891 square inches. The Sedona by Lynx L600 propane gas grill on cart is made of thick gauge 201 stainless steel using continuous welded construction to eliminate gaps where grease and moisture can collect. The fluid rotation handle and hood assist kit help you lift the hood of the grill easily with just a finger. Blue LED control panel lights and internal halogen lights make grilling at night a snap. This grill cart serves as a complete mobile grilling station with folding side shelves, one heavy duty swing-out cart door, magnetic latch and commercial-grade casters that make the unit easy to move. Bring the power and performance of Lynx innovation to your outdoor grilling with the Sedona by Lynx grill. I have tried to cook on this grille for over three years with various degrees of utter frustration. The infrared rotisserie side burner is excellent and will nicely roast a chicken but, the cage ends on the rotisserie rod loosen under heat and they lose their hold on the meat causing it to flop around on the rod. The butterfly screw in the locking collar is an engineering joke that needs an additional wing nut to keep it in place. The searing station does a good job of searing one ribeye steak at a time but, any more than one will cause a five alarm flareup and fire. There does not seem to be any happy medium to properly sear and cook steaks on this grille without constant supervision. The ceramic briquettes are a joke as they are too close to the grilling surface and any fat dripping on them during the cooking process will cause immediate, problematic flare ups that cannot be controlled, causing everything to burn. Cooking on a high heat causes incineration of the food and cooking on low to control the flareups requires a calendar as the cook times are very long. This model does not have a cool zone to allow convection cooking that would at least control the flare up issues since that would require a larger surface and an additional burner. As a professional chef, if it were not for decent stainless steel construction, I would give it a one star rating and cannot recommend this grille to anyone who likes to grill. 33 X 17 3/4" 33 X 17 3/4" 37 X 18" 38 X 19"